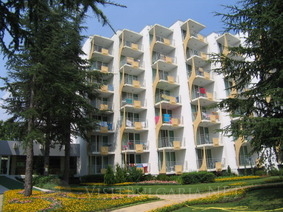 Location: Laguna Garden” hotel is situated at the beginning of the main street in Albena – 100m. from the sea , totally renovated in 2000. Accommodation: Laguna Garden hotel offers 225 double rooms and 29 single rooms. All rooms have a balcony, bath with shower/ WC, telephone, air condition, cable TV, hairdryer, mini bar- with extra charge. Safe deposit box and fridge can be rented on the reception desk. Wine & Dine: The hotel has an air-conditioned restaurant and a cocktail bar. Offers variety of meals, Show cooking, theme evenings, snack bar, The hall in the restaurant is for non-smokers. 460 places, 360 in the hall and 100 on the terrace. Lobby bar "Laguna Garden" is situated in the lobby of the hotel, serving local alcoholic and non-alcoholic drinks, cocktails, food, hot and cold drinks from 10 to 24 h.. All imported drinks are offered with extra charge. The hotel offers the following services: animation and conference hall, air-conditioned reception, change, hairdresser, mini – market, parking, outdoor swimming pool, swimming pool for children. It’s an All Inclusive hotel. Disco “Gorski Tsar” – 300 m. away from the hotel. A Lot of bars and pubs. Shops for souvenirs, drinks, sweets, beach goods, cloths – near the hotel “Dobrudja”.